Today, I went to the Vitamin Shoppe in Baileys Crossroads to hear my friend, David Foreman aka The Herbal Pharmacist, talk about heart health. I met Dave my first week at the University of South Carolina. (Go Gamecocks!) Dave was a pharmacy major and one of the first things I learned from him was to ask a pharmacist when you have questions about drugs, drug side effects and drug interactions. 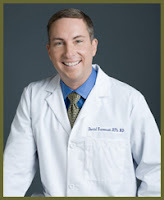 Dave's a pharmacist and a Naturopathic Doctor. He had his own pharmacy for 14 years and eventually came to the conclusion that there was a better way. He espouses four pillars of health -- diet, exercise, spirituality and supplementation. Like I said, today's talk was at the Vitamin Shoppe, so the focus was on supplements. Dave shared a four pronged foundational supplement program to support general health as well as heart health. 1. Multivitamin -- Dave suggests we take a multivitamin to make up for what's missing in our day-to-day diets. He suggested we look for a whole food vitamin and buy a vitamin for who we are -- male vs female (with or without iron) etc... He showed us a couple of examples -- New Chapter's Every Man Ii and Garden of Life's Vitamin Code Women. 2. Antioxidants -- OK, I knew a little about antioxidants and could have told you that they neutralize free radicals, but Dave finally explained what that meant in a way I understood. He said if you took a pin and pricked your hand you'd draw a drop of blood and then it would get a bit inflamed and scab over. Free radicals are like little pins floating through our blood vessels. The pricks they cause scab over with plaque. He also compared free radicals to exhaust. The more you exercise, the more exhaust or free radicals you create. Dave and his wife are training for a half marathon that's in Columbia, SC in April. 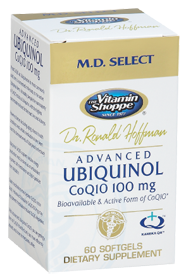 He said he increased his dose of CoQ10 to offset the additional free radicals he's producing while he's training. He suggested the following antioxidants -- Green Tea, Turmeric, CoQ10, Resveratrol, Grape Seed, and Pycnogenol (which he mentioned was also good for varicose veins.) I picked up a bottle of CoQ10 to offset all those free radicals I create kickboxing. I prefer to get my Resveratrol from a nice glass of red wine. 3. Omega-3's -- Dave talked about fish and plant based Omega-3's. He suggested 1,000 to 2,000 mg of fish oil for most people -- 4,000 to 5,000 if you have high blood pressure. Then, he pointed out something that should have been obvious to me, but wasn't. You need to read the label on fish oil supplements. For example, the bottle I have says 1,000 mg on the front, but when I read the label I learned that each pill has only 600 mg of of Omega-3's. Oops, I thought I had been taking 4,000 mg per day and I was only taking 2,400 mg.
Dave went on to talk about plant based sources of Omega-3's -- Chia Seeds and Flax Seeds. He said Chia Seeds have five times more calcium than dairy. I think I'll skip the ground flax seeds I usually put in my bowl of oatmeal tomorrow morning and try some Chia seeds instead. 4. Probiotics -- Probiotics are the friendly bacteria that finish off the digestive process. A probiotic enhances the nutritional benefits you get from food and other supplements. Dave said we should look for the label to indicate that they bypass stomach acid to get the full effect. Once you have the foundation in place, Dave suggested we could build upon it with other supplements to protect against or treat other conditions. He talked specifically about stroke, high blood pressure and cholesterol. For strokes, he recommended Nattokinase for both prevention and recovery and said it was safe to take with coumadin. He said Ginkgo Biloba is a natural blood thinner and has additional health benefits. For high blood pressure, Dave recommended a supplement like BP Manager. For cholesterol, Dave recommended Sytrinol. Dave is no fan of statins. He's been on TV quite a few times lately talking about it -- Healthy Alternatives to Cholesterol Medication and Are cholesterol lowering medications good for your health? Dave also suggested that knowing your CRP, C-Reactive Protein, might be more important than knowing your cholesterol. We've offered CRP screening as part of our wellness program, so I was happy to hear him say this. 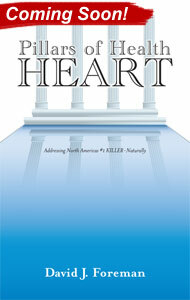 Dave has a book coming out in about five weeks -- Pillars of Health Heart. (I'm counting on an autographed copy.) In the meantime, you can listen to his radio show online -- Monday through Friday from 12:00 to 1:00. (There's a link on the left hand side of his website.) I have some ideas of how Dave and I might work together on some workplace wellness initiatives, so stay tuned here too! Now for the disclaimer, I was a business major. I have no medical training and I'm not a journalist. I hope my notes will help you look into some things that might improve your health. Hopefully, Dave will correct me if I got anything seriously wrong. Looks pretty good Janet. The only part I want to clarify is that not all fish oil supplements contain the same amount of Omega-3s...not the 600mg you mentioned above. Some contain as little as 300mg of omega-3s per 1000mg of fish oil while others may contain close to 900mg...just make sure you read your labels.